A simply way to spruce up grilled chicken! 1. Combine first 4 ingredients in a large zip-top plastic bag; seal. Marinate in the refrigerator for at least 30 minutes, turning occasionally. 2. Remove chicken from bag; discard marinade. Sprinkle chicken evenly with salt and pepper. 3. 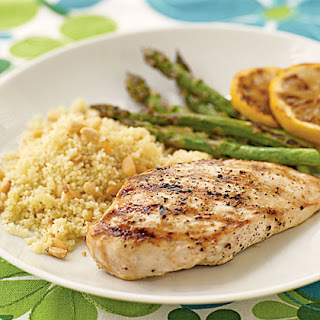 Place chicken on grill or skillet coated with cooking spray. Grill approximately 6 minutes on each side or until done. Tastes great served with brown rice or quinoa and fresh vegetable. Also tastes great in salads!